The exciting debut track "Burden Of Love" from Brooklyn based Sundub has been released and needless to say these incredible sounds are making me crave more. Read their bio to learn more about this band and their many talented individuals. 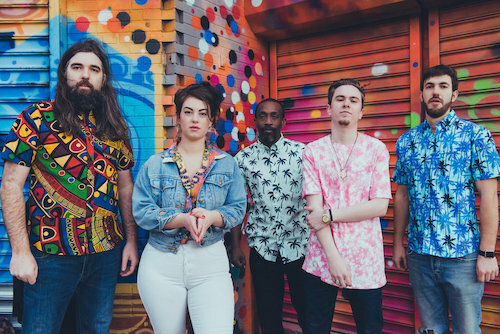 Brooklyn-based SUNDUB, an inventively collaborative mix of New York City musicians, has been offering its classic reggae repertoire peppered with soul and funk selections almost weekly since 2013. Anchored by a core quintet—Finnegan Singer (guitar), Josh T Carter (bass), Eric "The General" Toussaint (vocals-key) and the brother-sister team of Joanna (lead vocals) and Ben Teters (vocals-drums)—many of SUNDUB’s stellar and frequent collaborators have come together for its first production of original music, "Burden of Love." The album features reggae royalty Ruff Scott, The Chronic Horns (Easy Star All-Stars), Larry McDonald (Lee Scratch Perry, Gil Scott-Heron) and is mixed and co-produced by Sidney Mills (Steel Pulse). They lend their talents to Joanna Teters' commanding and soulfully smoky lead vocals and blend seamlessly with the super tight arrangements of the SUNDUB rhythm section. The result is a stand out expression of reggae’s classic undulating pulse and lush subterranean grooves, reinvented for listeners of all times and genres. Listen to the new track below and be sure to purchase the new single by clicking here.